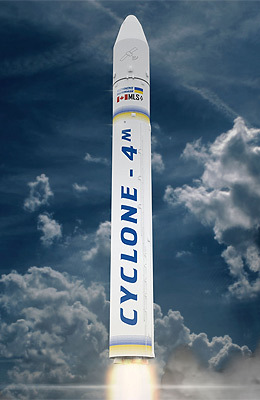 The Ukrainian Yuzhnoye designed Tsiklon-4M or Cyclone-4M is a launch vehicle primary for medium sized payloads in low earth orbits. The Tsiklon-4M is a replacement to the failed Tsiklon-4 project, but, inspite of the name, is largely not technologically related to this vehicle. The first stage of Tsiklon-4M is based on the LOX/Kerosene fueled Zenit-2 rocket with Ukrainian designed engines, creating a stage similar to the also Yuzuhnoye built Antares first stage. The second stage is inherited from the Tsiklon-4 project using hypergolic fuel with the restartable RD861K engine, but with increased diameter tankage. The payload fairing is also taken from the Tsiklon-4. Yuzhnoye has partnered with Canadian-based Maritime Launch Services (MLS) to set up a launch site in the Canso-Hazel Hill area, Nova Scotia, Canada. A maiden launch is envisioned for 2020.